Over 85% of online consumers these days are engaging with brands locally, whether through local listings, local sites, or search results. So you can’t be blamed for thinking that geo-targeting and running local PPC campaigns in Google Ads make a whole lot of sense. The only problem? 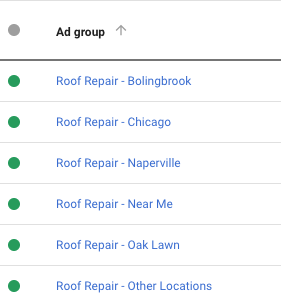 If you work at a multi-location franchise or company with multiple offices, local PPC at scale can be very messy. First of all, it eats up a lot of resources to set up and maintain. And, second, when you’re trying to appeal to prospects in many locations with different ads and landing pages, mistakes and resource costs can easily kill your Google Ads campaign profitability. The good news, however, is that—by using smart strategies and tools—you can scale your local PPC campaigns and target several locations at once without too many headaches. First of all, scaling can be messy without proper Google Ads campaign structure. Good structure keeps things clean—and keeps you sane in the process. Rule #1. Have a keyword theme for each campaign. Rule #2. Break your campaigns down into geo-focused ad groups. Your goal in establishing keyword themes is to match your paid audience with the message that is most relevant to their search intent. This means that each theme should represent a specific stage in the Buyer’s Journey, so you know how it fits into your overall PPC Strategy. Decision stage. Targeting people who know what they the want (ie. “kitchen remodeling”) and have already decided on it. Consideration stage. Targeting people who are considering an action (“should we remodel our kitchen?”) but haven’t decided yet. Awareness stage. Targeting people who may be DIY-types or people who are starting their research (“what’s involved in kitchen remodeling?”) related to the services your company offers. Once you’ve organized your campaigns into keywords themes in this way, you’ll need to figure out the ad groups they contain. Rule #2 is about creating geo-focused ad groups. That is, you should break your campaigns down into ad groups that are location specific. Not surprisingly, different types of location searches perform differently. Segmenting them helps you to see the big picture, prioritize the optimization efforts, and finally scale to suit your needs. To explore this idea further, we analyzed a few client categories, such as construction, legal, real estate, and interior design with over $10,000 in local PPC ad spend. Our research showed that searches with location performed better than general searches. Pro Tip. If search terms with locations are accidentally triggered in this ad group, use negative keywords to exclude them. You can then add the relevant keywords in the SKAG or Other Locations ad groups. The number of “near me” searches has been growing (as a result of increased use of mobile devices and voice search) over the past five years. This type of search represents Google’s Micro-Moments philosophy, where you have to “Be There,” “Be Useful,” and “Be Quick” in order to stay relevant to consumer behavior. You may already be familiar with single keyword ad groups (SKAG). As the name suggests, they’re ad groups dedicated to just one keyword. For local PPC campaigns, you can use Location SKAG to separate locations with enough traffic, when it makes sense to track separately. 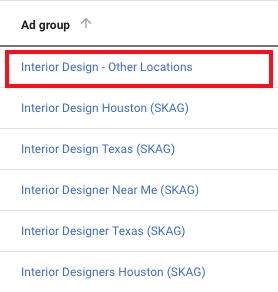 Finally, Other Locations ad groups represent all locations you are targeting except the ones in Location SKAG. The benefit of this is that you won’t need to create hundreds of ad groups that generate little traffic but require a lot of management time. This ad group is the place for location-based keywords unless (or until) they get enough traffic to split them into their own Location SKAG. Remember, once locations within this category become significant, you will want to promote them to separate Location SKAG. Pro Tip. Don’t overdo the number of keywords you use. Google has extended its exact match keyword to cover not only plurals and close variants but also word ordering and function words in exact match keywords. Simply put, this means you don’t need as many keywords, and including too many will make your life harder. Maintaining separate ad groups helps you prioritize optimization and testing efforts so you can have an impact and stay efficient with your time. But Tom, how can you have a message match between location search and your ad headline when you have many keywords in the ad group? Message match is all about making sure your prospects’ keywords, your ads, and your landing pages are all consistent. It can have a significant effect on your conversions. For good message match when scaling your local PPC campaigns, your ad has to match search terms with locations. This is why locality elements such as City, State, or even the word “local” (literally) matter a lot in your local PPC ad campaigns. 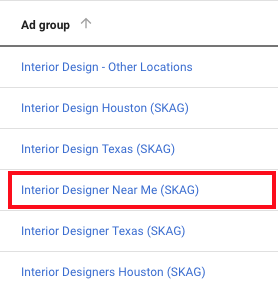 For most campaigns, creating unique ads for Non-Location, Near Me, or Location SKAG is manageable. But, when you get into the “Other location” category, creating relevant ads without the dedicated ad groups can be tough. 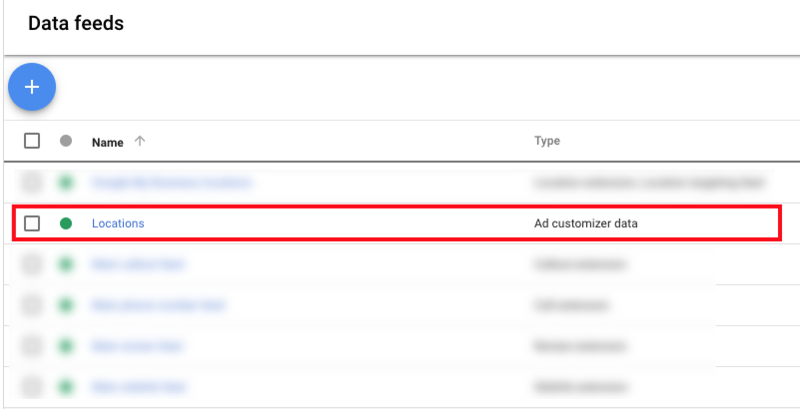 Ad customizers adapt your text ads to what someone is searching for, which device she’s using, where he’s located, or even the date, time of day, or day of the week. They can insert a price, the time left before a sale ends, and any other text that you define. Attributes: In other words, what you want to customize in your ad. This can be text, price, number, or date. Targeting: These signal when the attribute becomes active. There are seven targeting attributes. 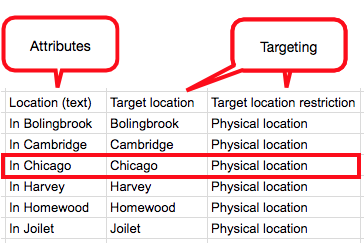 For local campaigns, however, location of interest and physical location targeting are the most useful. In the example above, we automatically include “In Chicago” in the ad text when the person searching is physically in Chicago. Once the conditions are met, the ad will automatically show the attribute defined in the dataset. 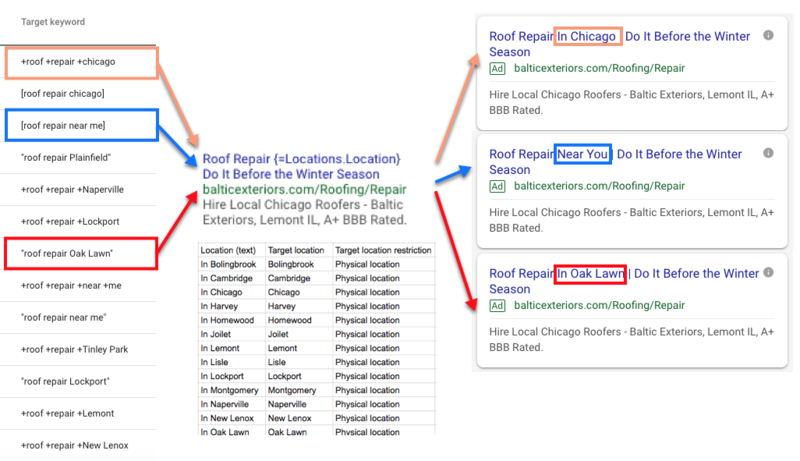 The final result will look like the example below, where the location name we defined (“In Chicago” in this case) will dynamically show up when the searcher is physically located in our defined location (Chicago). Pro Tip. Always keep one default ad without ad customizers for cases in which the conditions are not met. Otherwise, the ad group will not serve, and you’ll miss out on potential traffic. To create a local experience for visitors searching for local products or services, you need to emphasize location on your landing pages. To do this, you could create hundreds of landing pages using your CMS. While this approach will get the job done, it’s convoluted and extremely slow. Alternatively, you could custom code a template connected to a location database and automatically create hundreds of landing pages. With both of the above options, though, you end up managing hundreds of landing pages, which will create issues. No matter the approach, the ramp-up time for developing new landing pages can take weeks. Landing page customization usually takes us 3 to 4 hours per location. It’s not an efficient way, especially if you planning A/B testing and updates. With efficiency in mind, how do you get the job done faster? Fortunately, there is a third option. 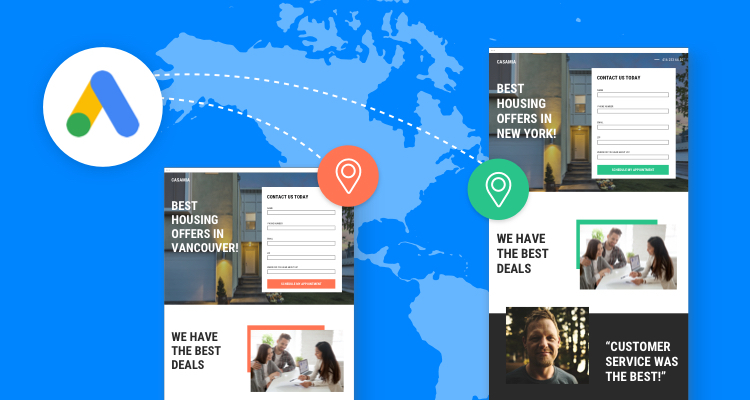 You can use Unbounce’s Dynamic Text Replacement to add location elements for each location variant landing page. Here’s a real-world example. 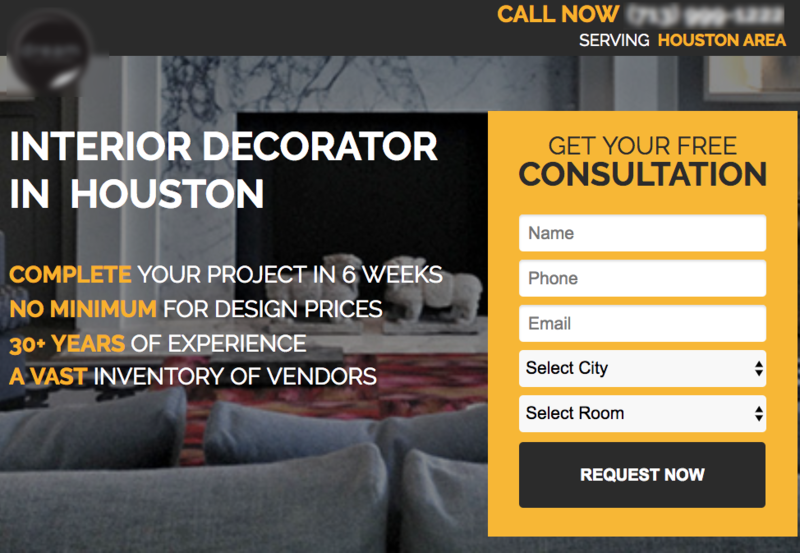 The landing page below has a unique headline for keywords representing different locations, so a visitor in Houston will see a different headline than a visitor in San Antonio. First, use the keywords from the campaign structure I covered above. You will find this feature especially useful for Location SKAG and Other Location ad groups. Finally, set the content to change when the URL triggers the keyword defined in your tracking template. Don’t forget to set the default text, in case the URL doesn’t have a keyword. Pro Tip. 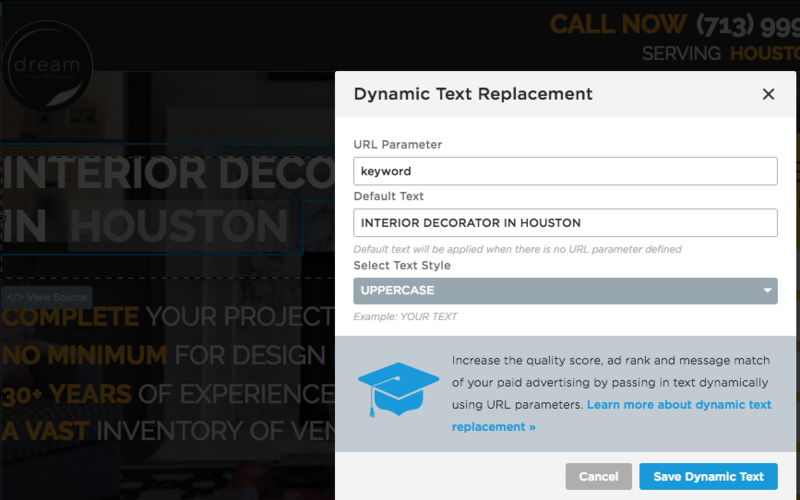 If you want more detailed instructions on how to set up Dynamic Text Replacement in Unbounce, take a look at the “How To” guide to learn the ins and outs of implementing it with Google Ads Keyword Insertion. To summarize, you can scale local PPC campaigns with minimal pain by focusing on campaign structure, ad customizers, and dynamic text insertion from ad to landing page. Investing the time to implement these strategies early on in your scaling efforts will pay off in the long run. How are you scaling your local PPC campaigns? Have any hot tips that I missed? Let’s discuss your methods in the comments below.